Each June, Little Dixie Community Action Agency Inc. participates in National NeighborWorks Week. As a NeighborWorks America charted member since 1997, LDCAA chooses to complete a community project within the tri-county service area. This project not only improves and strengthens the community; it celebrates the collective impact of the NeighborWorks network. Little Dixie CAA participates in National NeighborWorks week every year. This year, LDCAA chose to revitalize and renovate the Broken Bow Early Learning Center in Broken Bow, Oklahoma. 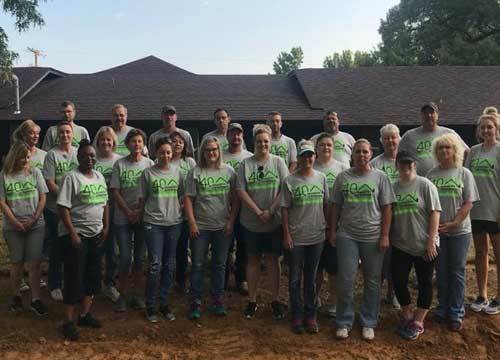 Twenty-seven volunteers representing various agency programs traveled to Broken Bow on June 5th and spent the day laying mulch, planting flowers and shrubbery, pulling weeds, raking leaves, cleaning playground equipment, laying gravel, hanging cabinets and organizing classrooms. Additionally, LDCAA was fortunate to have the expertise of various community partners including Heady Trucking and Kiamichi Landscaping and Irrigation. Despite the Oklahoma heat, the volunteers banded together in order to improve conditions at the Broken Bow ELC for the staff, children and families that are positively impacted by the center. Less than 250 non-profit organizations are members of the NeighborWorks network. Through this partnership, LDCAA is proud to drive change at the local level for individuals, families and communities.